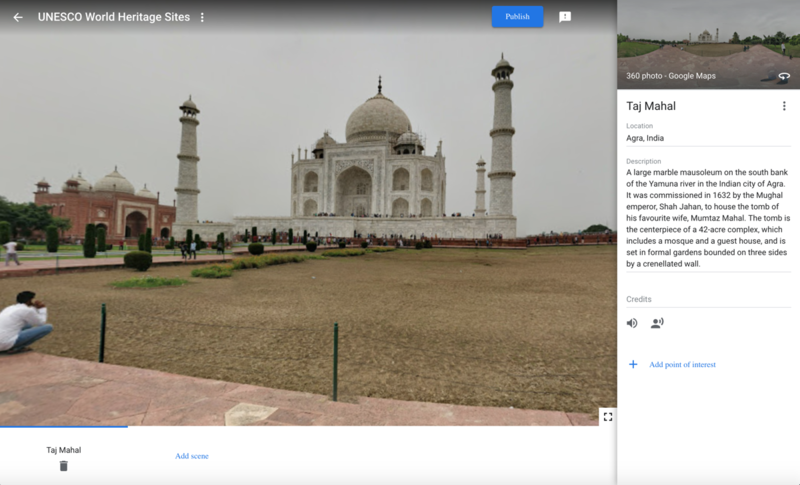 In May of 2018, Google released a new tool for building interactive, 360° tours called Tour Creator. 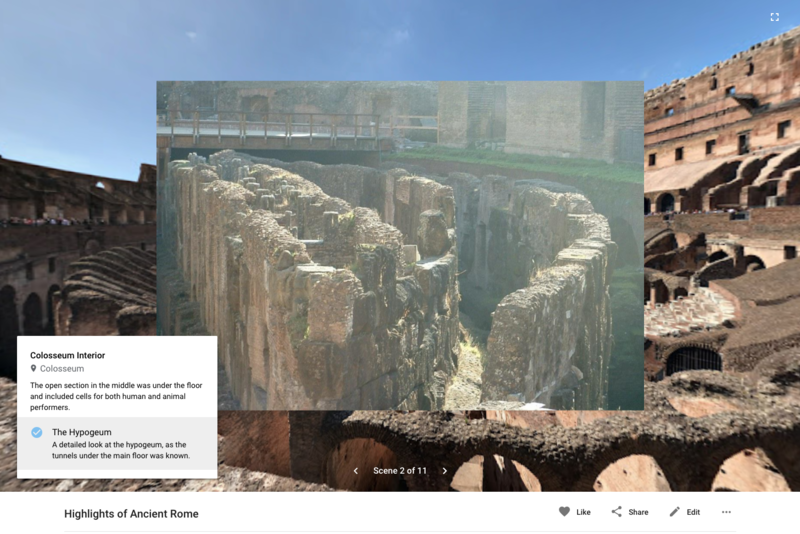 This resource makes it easy for teachers and students to build activities similar to what you may have seen in Google Expeditions. I call it DIY VR. 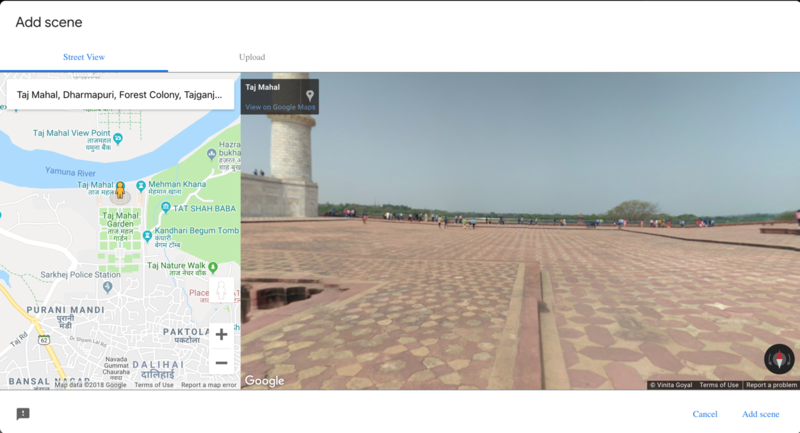 Tour Creator primarily uses the images found in Google’s vast Street View database of 360° images, but you can also use photospheres created by individuals that have been posted to Google Maps. And you can upload your own 360° images taken with your smartphone or one of many 360 cameras. This post is a short introduction for using Tour Creator as it was on the date this tutorial was posted. I expect Google will be adding features and regularly improving this resource in the future and I will try to update the material on this site as they do. As with any other project, you’ll need to do some planning before you start creating a tour. So, what kind of tour do you want to build? Locations from a historical event. Maybe take a tour of battle sites from World War II in the Pacific. Or important events leading up to the American Revolution. Visit the locations used in a book your students are reading. The concept of a “LitTrip” in Google Earth and Maps has been around for a long time, so now we can move it into the world of 360. Highlights of a city or country students are studying. Instead of just reading about another culture or viewing static images, a tour would be more dynamic and interesting. Visit scenes from the biography of a historical figure. Street View includes many images from inside homes and other locations, so these could be included on a tour as well. Get an immersive look at various biomes around the globe. Google has taken Street View far off the street into deserts, jungles, and glaciers, and all of these images could be part of your tour. Are you getting the idea? Any topic that involves locations somewhere in the world could be the foundation for a great tour. If you need more examples, visit the tour section of the Google Poly site. On that page, you can view the most recently published tours, use the search bar to find tours based on their title or description, or click on the Main menu in the upper left corner to select a tour category. The tour you build in Tour Creator will consist of two or more locations, called scenes. Each of those scenes will include a 360° image, so you’ll need to know the location information for each scene. As with most Google products, you can search for the location in many ways: street address, latitude/longitude, or common name (such as Eiffel Tower, Paris) are three ways. Scenes can also include a text description, image overlays, audio narration, and markers showing specific points of interest within the 360 image. Creating these features should be part of the planning process. For this example, I’m going to start building a tour of UNESCO World Heritage sites. Since there are almost 1100 of these sites, I will limit this tour to just a few. Google recommends 5-7 scenes in a tour. I think 10-12 is a better range. But for this example, I’m just going include these 5: Taj Mahal, India, Monté Alban, Mexico, Mont-Saint-Michel, France, Angkor Wat, Cambodia, and Petra, Jordan. Start by going to the Tour Creator site and click the Get Started button. If you’re not logged into a Google account, you will be asked to do so at this point and all your tours will be associated with this account. If you’ve never created a tour, this page will be blank. Later, all of your tours will be shown here, allowing you to view or edit them. For now, ignore the link that says Templates since that’s more complicated that the name might imply. Click New Tour instead. First, give your tour a name and a short description. Next, choose a category for your tour. Finally, upload an appropriate still image to decorate the listing for your tour. None of these pieces are required but they will help you and your users better understand what the tour is about. In the next window, search for your first location. In this case, it’s Taj Mahal, India. We need the name of the country because Google will start by searching the local area (in this case, around their headquarters in Mountain View, California) and you may find restaurants, stores, and other businesses with the same name. When you arrive, the view may not be the one you want. In that case, click and drag Peg Man (the orange figure on the map) to see all the spots where Street View and other 360 cameras have visited in the area. You can use the + and – buttons to zoom in and out of the map to offer more details. To choose the exact location you want to use in this area, just drop Peg Man there. Don’t worry if the image is not pointing in the right direction; we will fix that later. When you have the location you want to use, click Add scene in the lower right corner. In the right column of the scene edit window, give it a name and a description. Users will see the name in the list of scenes and can read the description when they click on the information icon. The credit line is generally not necessary if you’re using Street View but should be used if you upload a 360 image. In the lower part of the right panel are two sound icons, one for “ambient” sound and one for narration. Both of these must be mp3 files that you’ve already created. At this time, there is no way to record sound directly into Tour Builder. You can also add a point of interest, and we address the basics of both that and sound below. To establish the point of view you want user to see when they arrive at this location, click Set starting view in the lower left corner. Then rotate the scene and click Save. The starting view must be at eye level so you can’t be looking up or down. When you are ready for the the next scene, click Add Scene following your last location in the bottom section. Don’t worry. Your work is automatically saved and you can always return to edit anything in your scene. In addition to using Street View, you can also upload 360 images taken with the Street View smartphone app or a dedicated 360° camera. More details on taking 360 images can be found here. 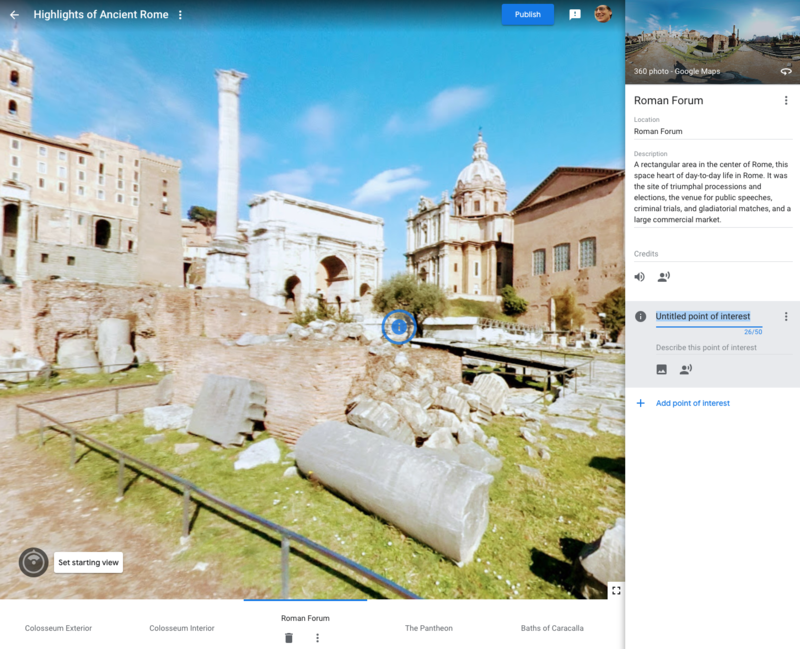 To add a 360 image to your tour, the file must be on your computer or in your Drive folder. With your tour open for editing, click Add scene and then Upload. Drag the image file into the window or click the link to find it. Click Add scene. Now follow the steps above to add a title, location, and description. You should also enter the name of the photographer in the Credits line. A point of interest is an icon you set in a location to draw the attention of your user. Clicking on the icon will reveal additional text, an image, and/or audio you created to provide more information about the location. In this location, we see a photo overlaid on the scene with some text about the picture. You can add one or more points of interest to any scene by clicking the Add point of interest link in the right column when editing a location. This will place the icon in the middle of the current view but you can drag it anywhere while still editing the scene. Enter a title and a description for this particular point. Click on the image icon to add a picture that will be displayed when the user clicks on the point of interest icon. Click the sound icon if you want to upload an mp3 file with some narration for this point. If you decide you don’t want this point of interest, delete it using the three button menu at the right. In the main window of a location, you can include two different sounds. One is intended as background, ambient sounds that give a feel for the place. The other is a narration which verbally explains something about that location. Neither is required and both will play immediately when the location is opened. Sound files must use the mp3 format and be located either on the hard drive of your computer or in a Google Drive account. To add a sound file, click the appropriate icon, find the file, and click Add. One sound file can also be added to each point of interest in your tour. Recording a short sound file is easy on a standard computer since the operating system likely came with a basic audio recorder. On a Mac, use QuickTime and choose New Audio Recording from the File menu. In Windows 10, Windows Voice Recorder can be downloaded free from the Microsoft Store. If your students are using Chromebook, you will need to find a web application or Chrome extension to do the job. And that’s the basics of using Google Tour Creator. But the best way to learn what’s possible is to dive in and play with it yourself. Better yet, show it to your students, let them explore and let them show you want they find. This page is accurate as of the date it was last updated. However, Google will likely be adding more features in the near future. For example, while I was finishing these directions, Google added the ability to set a starting view for a location. I will update this page as needed but you may also want to follow Google’s Map Platform Blog for new announcements.